Bridges... have you ever burned one? Figuratively? I recall three... all burned over thankless jobs when in the heat of the moment I had had enough and justifiably walked out and vowed never to return. There was the high school summer job working the 3 to 11 PM shift printing banners for a small company with a "No Sitting" "No Talking" "No Breathing" policy. I quit after being reamed out by the owner for wearing a small Band-Aid on my finger while working. Immediately afterwards the foreman pleaded with me to stay, "Sit, drink coffee, read magazines the rest of the night, but don't go," as I walked out the door. Then there was the job straight out of college for another printing firm that offered a decent wage and position, which were slow to materialize. After a few months, I quit. Management said they thought I was overqualified and were waiting to see if I'd take a better offer elsewhere, or enroll in graduate school before they made good on their promises. I promised never to return. And then the dream job which turned into a nightmare after discovering that the Philadelphia elementary school that hired me to teach Art had zero supplies and zero chances of ever getting any. So instead of teaching "Conceptual" Art or forever paying for my own materials, after a week, I resigned. "Water Under The Bridge" as they say, an idiom meaning something that happened and can't be changed. Besides... "Burning One's Bridges," making decisions that can't be changed, or cutting off the path from where you came. There's... "A Bridge Too Far," a plan whose ambition overreaches its capacity leading to difficulty or failure. "Bridge The Gap," to make a connection where there is a great difference or to create something that will only serve temporarily. "Cross That Bridge When You Come To It," to avoid needless worry about a difficult situation until it happens. Something I've been retelling myself ever since the start of the 2016 Presidential Election and honestly it's not working... the idiom, the election, and my anxiety, an anxiety never felt to this degree in my entire adult life over a President-elect. Anxiety, bridges, and how people do and don't cope are the subjects of an interesting and at times amusing piece printed in "Philadelphia Stories," a quarterly publication, and written by R.G. Evans called "Crossing Bridges". "I don't remember when the panic attacks began, but I do remember where. 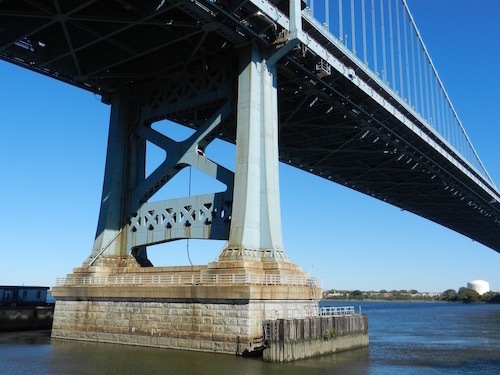 The first one hit as I ascended the deck of the Delaware Memorial Bridge, the twin span across the Delaware River connecting Delaware to southern New Jersey, a bridge I'd driven across hundreds of times over the past twenty years. My mouth began to fill with saliva and my throat felt swollen, on the verge of closing altogether. My tongue seemed to swell and I felt my heart pound as both my hands sprang off the wheel and clasped tightly over my mouth. Somehow, I managed to keep control of the car till it reached the summit of the bridge and immediately, I felt normal again, not dying at all, just casually driving down the western side of a bridge that moments before had tried to kill me." ... continue reading the complete story here. And if "Burning Bridges" and "Crossing Bridges When You Come To Them" fail to lessen your anxiety, try Yoko Ono's method... a primal scream here. ... crossing all other bridges only when you have to! I'm late in posting a comment or two but had wanted to get one in. Better late than never, right? Bridges....As a child I was terrified of them. It was a childish, irrational fear. Today I still don't like them but now I have a justifiable reason. I have seen examples of bridges collapsing and have the knowledge that many of our bridges are crumbling and unsafe. Yes, I burned a bridge once when I sent a letter to the faculty and vice-principal on the graduation committee at the high school when my son was graduating. He was a valedictorian from his class and had written a speech to be delivered at the graduation ceremony. It was funny and poked a little fun at the school and the administration but at the end had a very positive, complimentary message. They wouldn't let him give that speech unless he changed it,which he refused. I was furious so I wrote a letter to each of those people telling them exactly how I felt about it and scolding them. I was a substitute teacher then but only subbed in the elementary schools. If I had wanted to sub at the high school, I'm not so sure they would be very open to hiring me. How true to be apprehensive or fearful of Bridges today. This past Sunday the front-page headlines in our Local Philadelphia Inquirer newspaper read: "Cracks in System." 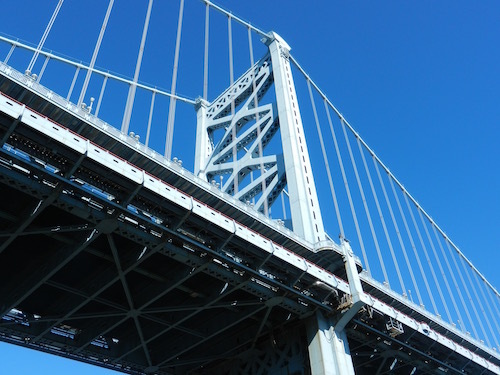 "The Troubled State of PA. Bridges: Nearly One in five Spans Are Structurally Deficient. Then the paper went on to say that Pennsylvania ranks among the worst in problem bridges. 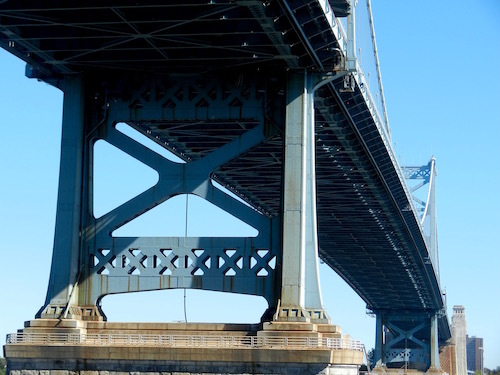 Recently a painter on the Delaware River Bridge noticed by chance something so alarming authorities rushed to close the bridge to the 42,000 cars that cross it each day: a beam beneath the bridge's deck split in two." Guess there should be signs on these bridges... "Cross at You Own Risk." re: Burning Bridges... You and your son Jeff certainly stand up for your principles! I admire you both... Jeff for refusing to cave in and change his speech, a speech he obviously believed in, and you for firmly supporting him and giving those authoritarians a piece of your mind. Some bridges are obviously worth burning.